In 2006, five years after 9/11, director Paul Greengrass made and released a dramatized version of events surrounding the one plane where the passengers revolted against the hijackers. At the time, United 93 was met with controversy by some who felt it was too soon to be making films about an event that was still a vivid memory for many, but that didn’t stop Greengrass – neither did it stop Oliver Stone, who made and released his own film World Trade Center that same year – from bringing the events to the screen with precision and careful dramatization, all done in his own documentarian style. Once again, he has set out to recreate another dark moment in modern history, this one being the 2011 terrorist attacks in Norway that left nearly eighty people dead (many of them just teenagers), and while 22 July may lack the intensity and gripping real-time pacing that some of his other movies had, including United 93 or Captain Phillips or any of his Bourne movies, here he tells a harrowing but altogether inspiring film that commemorates the survivors and their bravery in standing up against the force of pure evil they were pitted against. If the events of 22nd July 2011 are somehow not known to you, here are the facts: far-right Norwegian activist Anders Behring Breivik (chillingly portrayed in the film by Anders Danielsen Lie) detonated a bomb inside a van outside a building in the centre of Oslo’s government district. He then makes his way to the island of Utøya, the site of a political youth camp, posing as a policeman sent to keep the teens safe. Once there, he begins opening fire in a massacre that would see him kill sixty-nine young teens, and severely injure several others; one of the wounded is Viljar (Jonas Strand Gravli), who is left blind in one eye and virtually unable to walk without the assistance of a walking stick, but strives to appear strong when he is summoned to testify in the forthcoming trial. 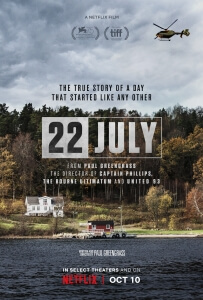 The film focuses more on the aftermath of the events than what actually happened on the day itself; that part is shown to us within the first half hour, while the rest of it is about the survivors trying to cope, the lawyer assigned to defend Breivik, the Prime Minister overseeing the inquiry into how it happened, and the victims’ families all trying to seek justice for the attacks. Greengrass doesn’t give this film the immediacy he gave to United 93 and Captain Phillips, because he has chosen to tell a story that takes place over a longer period of time, as opposed to the mere days or even hours over which those films unfolded, and there is no need for tension in a story that takes its slow time unfolding. It’s a far more intimate film than it is an immediate one, as it places most of its focus on the personal struggles that the survivors, predominantly young Viljar, are going through as a direct result of the attacks, from the post-traumatic stress to survivor’s guilt to even just shutting themselves away from the world, and it can stir up a lot of emotions just by watching these poor young people who have just had their lives changed forever. Be that as it may, I can see anyone putting this film on expecting to see a film like most of Greengrass’s films in the past, in that it’s a tense and suspenseful thriller of sorts, being a little disappointed to find that this is more of a crime drama than anything; a well-made and emotional one, but not exactly what some may be expecting out of this. I found the film interesting in how it took into account almost every corner surrounding this story, including how Breivik’s lawyer goes about trying to find people who could testify for his client, even though he clearly wants nothing to do with this absolute monster of a human being, and how the government inquiry summarises the numerous ways in which he could have been prevented from carrying out the attack. Greengrass has always been good at doing his homework on these kinds of films, and 22 July is no exception as he finds a way to dramatize everything without it sounding like a glorified Wikipedia article; he has the actors – largely made up of unknown (English-speaking) Norwegian actors, adding to the director’s documentary-like style – convey all this information naturally and then react to it like any real person would when presented with the facts, but also allows them moments to talk and emote like actual people which, within the confines of a movie, helps the audience relate more to the characters’ struggles. Some will probably see this as a cold exposition dump, while others will see it as an emotional testament to the strength of the event’s survivors; I see it as both, because I find that it manages both exposition and drama with just the right amount of emotion and intrigue, similar to how Spotlight was able to do so a couple of years ago. As ever, Greengrass’ documentary style lends a real sense of authenticity to how he portrays these events, and while I don’t think it ranks as highly in his filmography as United 93 does, 22 July is still a powerful and emotional dramatization that gives us the cold, hard facts without skipping over certain parts, and holds your attention just long enough to see it all the way to its bittersweet conclusion. He has managed to capture the raw emotion of the many people left shocked and traumatised on that fateful day, while also serving as a heartbreaking reminder of the people lost on that day too. 22 July sees Paul Greengrass dramatize the tragic Norwegian terrorist attacks of 2011 with his usual documentary style, which lends a sense of authenticity to how everything unfolds here, but he also adds a level of emotion that’s powerful enough to hold your interest throughout all the detailed recreations that some may find to not be all that exciting.